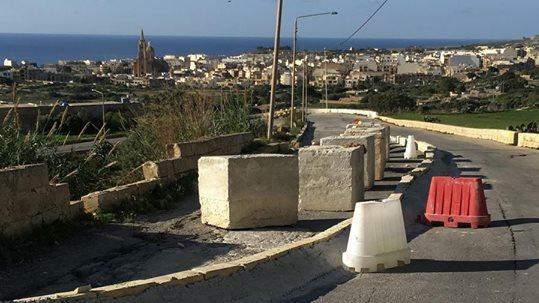 The road which leads from Nadur to Mġarr in Gozo has been closed after a section caved in, two months after the minister for Gozo said the entire road would be rebuilt. Minister Justyne Caruana had announced on September 6 during an on-site press conference that the road would be rebuilt after years of neglect. Works were to be started immediately with the channelling of utility services underground, before new foundations were laid and the road rebuilt. Shadow minister Chris Said said on Thursday he had been speaking about the state of this road in parliament for the past three years and had pointed out the danger of collapse. Now that a section had indeed collapsed, motorists who needed to go to Mġarr from Nadur had to take a detour through Xewkija or Qala, he said. Two months had passed since the minister's press conference, and no work had started, he said. The Gozo Ministry said preparatory works to rebuild this major road has long been started but given the complications that arose, more studies were needed to be carried out to ensure the road is properly rebuilt. "The caving in is in itself proof that the road needs radical rebuilding," it said. The contractor that won the bid closed off the road to minimise the danger as this was evident. "Given the fact that this arterial road linking the village of Nadur to Imgarr harbour, has been neglected by previous administrations, it required thorough build-up and not just maintenance."